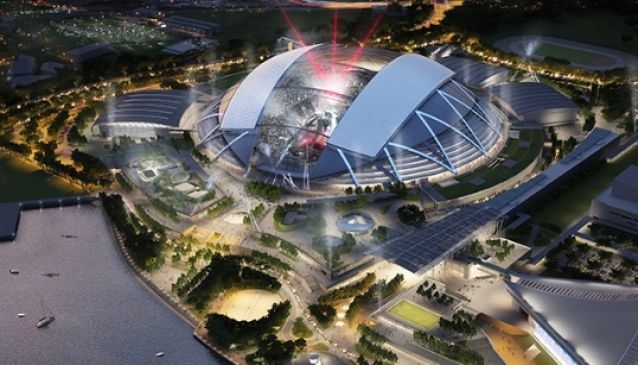 The National Stadium, the central feature of Singapore Sports Hub, is a state-of-the-art, multi-purpose facility designed by DP Architects and Arup Associates to be the most compelling venue for large-scale sports and entertainment events in the region. The first of its kind in the world, the stadium spans 312 metres and boasts the largest free-spanning domed roof that offers breathtaking views of the waterfront and Singapore's iconic city skyline. It also works in tandem with an innovative air-cooling system ensuring athletes and spectator utmost comfort, shade and shelter at any of its 55,000 seats. The stadium's tiers of seat are arranged to provide optimum spectator viewing distances and allow for multi-sports use, including football, rugby, cricket, athletics, Concerts, Family entertainment and other community events. Capacity includes: Football/Rugby: 55,000; Cricket: 52,000; Athletics: 50,000; 8,000 Club Seats and 62 Corporate Suites.